The fighting began 16 December 1944 and became the last offensive by Nazi Germany in World War II. As soon as the Allies had broken out of the Normandy Beachhead, they pushed the Germans back rapidly until they had reached the German Frontier in November and December. The U.S. was giving some Divisions a rest and inserting newly landed Divisions into the front lines, not thinking that the Germans were capable of any offensive action and if so that they would certainly not be bold enough to try in Winter. 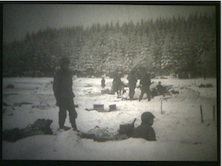 This last desperate effort by the Germans would become known as the Battle of the Bulge. The Allies had no clue that the Germans were going to start a massive offensive in the most unlikely of locations, the dense Ardennes Forest. Under the cover of bad weather, when aerial reconnaissance was not available, the German Army struck at dawn (0500) on the 16th with thirteen infantry divisions and eight armored divisions opening up with an artillery barrage on the American positions. The tanks and infantry ran right over green U.S. troops that were not prepared or equipped for the weather or the Germans. The German Sixth Panzer Army under the command of Generaloberst der Waffen-SS Josef "Sepp" Dietrich was the spearhead into the Ardenne Eiffel and were located on northern (right wing) of the German line. The Fifteenth Army would support the Sixth on their right and rear. In the center of the line was the German Fifth Panzer Army under Gerneral der Panzertruppen Hasso-Eccard von Manteuffel. On the left led by Gerneral der Panzertruppen Erich Brandeberger was the Seventh Army comprised of infantry and mechanized divisions. These divisions would protect the German southern flank. The first goal of the attack was to get across the Meuse rivers with the ultimate destination of the port city of Antwerp. The US 1st Army stood between the germans and their targets. A number of the divisions were exhausted and undersupplied after fighting their way across Europe, others were brand new 'green' divisions that had not seen combat. It was thought that an easy initiation to the war would be appropriate for them and no better place than the quiet Ardenne sector. The US 4th, 28th, 99th and 106th Divisions along with the attached 14th Cavalry Group would find themselves closest to the German spearhead when the battle began. Surprise had caught the American troops unprepared. Military intelligence was caught unawares. It took two days to determine that this was a full scale operation by the Germans and by that time there was disaster and panic along the rapidly collapsing front. Immediately, the 101st Airborne was thrown back into the line and headed to Bastogne, a city that was located at the junction of five highways, a communication center and location where a large sector of the country could be supplied and reinforced. As the Germans advanced a large Bulge was created in the U.S. lines, giving rise to the name battle of the bulge. The front was over 50 miles across and at one point the deepest penetration by the Germans was over 50 miles. As the Bulge grew the city of Bastogne became surrounded, but the 101st Airborne and some units of the 10th Armored held stubbornly and would not surrender. However, the weather prevented any air support or re-supply, so these men were on their own. When the 26th of December arrived, the weather was clearing and re-supply was available. Additionally, elements of 4th Armored under the Patton's 3rd Army broke through the German lines and entered Bastogne on the 26th from the south. The Germans started to run low on supplies, the offensive stalled and the bulge began to collapse. When the German offensive began it was under a low cloud ceiling of a winter storm, grounding Army Air Forces planes. This contributed to an intelligence failure by the Allies to detect a German buildup. After the attack began planes were still grounded so it would be up to the men on the ground alone with their rifles and the tanks to blunt this German thrust. As the salient expanded, German supply became stretched, during this time more Allied divisions rushed into the line. 5th and 6th Panzer Army advance slowed and when weather lifted the tide rapidly changed. Fighter aircraft could strafe infantry, wing mounted rocket fired ordnance could be used against the armor and supplies could be dropped to the men in Bastogne. It took until the end of January to repulse all the German units back to the lines the Allies held on 15 December. There would be more fierce fighting ahead but most of it would be on German soil. This was Germany's last chance at glory. In 1965, brought to the silver screen, a fictionalized movie version of The Battle of the Bulge as was told through the eyes of an American Intelligence officer, Lt. Colonel Kiley (Henry Fonda) and German Panzer Commander, Colonel Hessler (Robert Shaw). It had an all star cast that included, Robert Ryan, Dana Andrews, George Montgomery, Charles Bronson, Telly Savalas, James MacArthur, Werner Peters and many others. A popular movie, it does not give one the full scope of this memorable WW2 action. Combat Reels is not Hollywood; we are historians, using as much raw archival combat footage where we can positively identify the unit involved, working to tell the broader story as well as the specifics of individuals and units. Combatreels is creating our next series of DVDs with footage from various sources including the Signal Corps Photographers of the US Army. As with all of our DVDs footage will shown by individual Division. We plan on releasing individual DVDs as they are completed. This will be our 1944-1945 Europe Winter War: The Bulge and Beyond Series.